Okay I will admit the title of this tread is a bit of click-bait, but don't click away yet! You might have seen me at Flite Fest East the last two years running around in a colorful dinosaur tank top. I am a senior mechanical engineer at Trine University which is a private university in the Northeast corner of Indiana (https://www.trine.edu/). 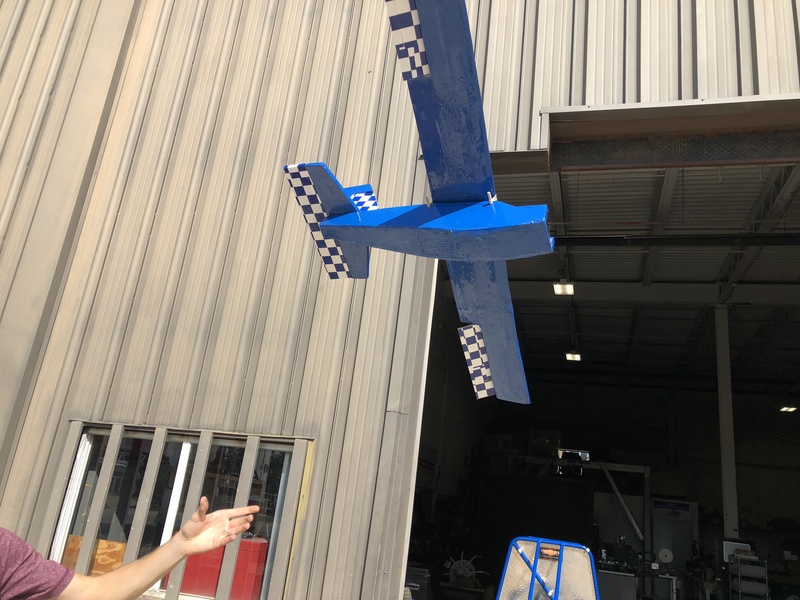 Now to why I am making this tread, my year long senior design project is to work with 5 other students to design and build a RC airplane for the American Institute of Aeronautics and Astronautics (AIAA) Design, Build, Fly contest. My hope for this thread is to show details on how our design and building is going, and get help from you all if our airplane is not cooperating. During the first 3 weeks of school our project's adviser wanted us to build a simple plane to learn the basics of how to build an RC plane. We decided to go with a basic super cub design for simplicity. I took a 3 view of a Super Cub, imported it into CAD, traced the general outline, and scaled it accordingly to make a pattern for our plane. We then used the patterns to cut out all the necessary pieces. We cut the pieces out of pink insulation foam, and glued them together. A hot wire and airfoil pattern was used to cut out the wing. Next, the electronics were installed and tested. Then the whole plane was covered in Monokote. The pictures posted are from the first couple of glide tests that were conducted. After we got it to balance out correctly we took it to a local park to fly. I felt like the plane was heavy for its size, but it flew fairly decent. The plane definitely did not have enough aileron authority. I was able to bring the plane in for two landings without any damage. This was the first time that I have flown using NIMH batteries and I would have to say I do prefer LIPOs. Overall it was a good learning experience for our group, especially since I am the only one in the group with RC experience. We identified some basic flaws in our design. One of these flaws was with our servo instillation We installed the servos with hot glue as I normally due with my scratch builds, but the foam started to separate from itself which caused our servo to not effectively move our the ailerons. Our team has already gone through concept selection and concept generation. For this part of the project we listed as many designs as we could think of each subsystem. The subsystems ranged from the fuselage shape to number of wings, to how the wings will fold. The team discussed each design and eliminated designs that were unrealistic or violated the rules. One of these unrealistic designs was to use flash paper to construct a little compartment under the wing for each foam dart to sit in. An sparking device (2 wires close together) would be hooked to the edge of the flash paper, and when it came time to drop the dart the flash paper could be ignited. If style points were available this design would have not been eliminated immediately. For the remaining designs additional studies were done to find the best option for the plane. A basic CAD model of our design is still in the works. 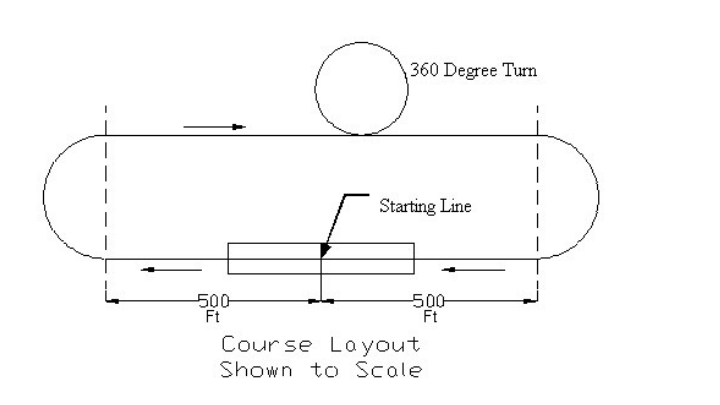 To come up with a basic size of our plane the team estimated the overall weight of the plane and created a sizing graph based off of the process outlined in the book Aircraft Design: A Systems Engineering Approach by Mohammad H. Sadraey. 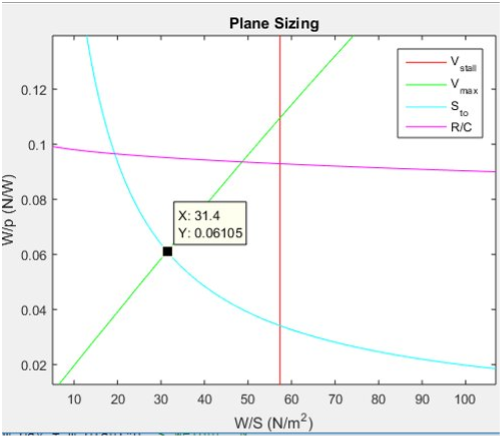 We ploted the results using MATLAB to obtain the Plane Sizing graph shown below. The X-axis is wing loading and the Y-axis is Power loading (weight of the airplane divided by the power of the motor). Any point that is below a line is obtainable given our input conditions. The design point that we chose is highlighted. This design point gave us a wingspan of almost 9ft with a cord of about 10in. This graph gave us a rough estimate of what size our plane needs to be in order to complete the missions. Now that all of that is out of the way. I look forward keeping you updated on what we are doing and being able to answer questions that you have, and most importantly getting your suggestions on what we can improve to make our plane fly better! Can I suggest looking into LiFe and similar batteries as aposed to Nihmih? I gave the rules a quick perusal and it seems simple enough. My only real question is does your team have access to a 3D printer? Yes we do have access to a 3D printer, a couple of them to be exact! Are you just dropping the darts or do you need to shoot them? A 10 foot wing. How much weight are you planning to carry? How long is 1 lap? I reread the rules to see if Graphene would be allowed, but it says," Must use over the counter NiCad or NiMH batteries." I thought it just said no lithium batteries, but I was wrong. We just have to drop them. 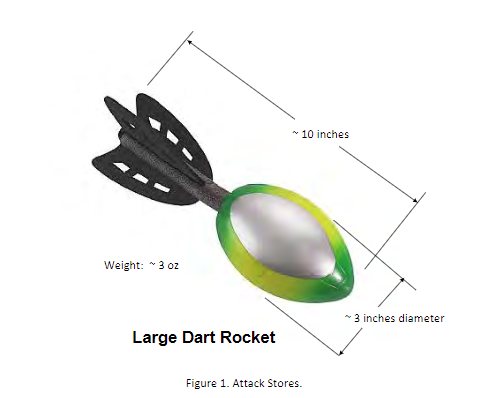 I attached a picture of what the darts look like for reference. We have a rough estimate of weight which was 6.71 pounds. A lap is roughly half a mile long. Here is a picture of the course we have to fly. That is a long course, good thing you have a 9ft wing, anything smaller would be hard to see at 500 feet. At 14.3 oz/sqft wing loading, you'll need to keep you speed up. I would not let my wing loading go a lot higher. For endurance your wing is great, 10:1 span to cord ratio. For speed you might want to consider a shorter span with a wider cord, something 6-8:1 ratio. A shorter wing will also make tighter turns. Do you have a plan to drop the darts? I would set it up with servo controlled rails, on each side of the wing, that way you can drop one at a time. 3. Twin engines, forward mounted. If you want your aircraft to take off in 10ft, you need control as slow as possible, and extra lift. Having a pair of props in the front gives you both lift and thrust, basically putting a good section of your airfoil in airflow that is constantly out of stall. Place a pair of control surfaces on the trailing edge behind these engines for extra control authority. If your *really* want extra control authority, use a full airfoil aileron like on the STOL aircraft. That way, you keep your aileron out of the boundary layer for extra slow-speed control. 4. On motors, go for something that is optimized for cruise, like the RMRC Anaconda. The motor on the Anaconda is low KV, but it spins a beefy prop with a lot of pitch behind it. The good thing about this is it gives you a massive amount of somewhat inefficient thrust for takeoff, but you can lower the power to a very low percentage and that propeller pitch will give you a good cruise speed. 5. You need a wing retraction mechanism that is entirely automated...wow...Uh, i would be learning some arduino for servo control super quick. Not only will it simplify your dart drop if you can write a program to open a different drop with each servo pull, it can automate the wing fold. 8. On size, you need to fit in a 2x3 box. Theoretically if you have an asymmetrical fold (where one wing folds tilted forward and one folds tilted back), you could fit a 9ft wing in the box, absolute max. -has an easy to view safety mechanism to make sure that you are not taking off with an unsafe aircraft. Thank you for your feedback! We will talk about lowering our aspect ratio a little bit to get more speed. We do have an idea for dropping the darts. We are planning on using a rubber band where one end will be attached to the spar of the wing, then wrapped around the dart, and then the other end will have a 3D printed or laser cut piece that can be "plugged" into a mechanism inside of the wing. The mechanism inside the wing will have a servo that holds the part attached to the rubber band and then releases it when commanded by the transmitter. I don't know if that made much sense, but we should have a CAD drawing for it pretty soon. Thanks for all that information! We greatly appreciate it! 1. Do you have any brands that you recommend for NIMH batteries? Also do you have any preferred vendors? We have some Elite cells from previous years competitions and I have been looking at Turnigy batteries from HobbyKing which seems to be about the only place I can find individual NIMH Cells. 2. A flying wing is a good idea, but unfortunately we already decided to go with a tailed plane. Would it be smart to taper our wings still? We could increase the chord in the center of the wing and taper towards the end so we have the higher aspect ratio for speed but then also have the taped section for a higher aspect ratio for better lift to drag? 3. That is defiantly something we will have to talk about as a team! 4. What exactly do you mean by a motor optimized for cruise? It having a low KV? And what are you considering a low KV, 300-400? 5. The rules say that we only have to take our wings from being retracted to extended. 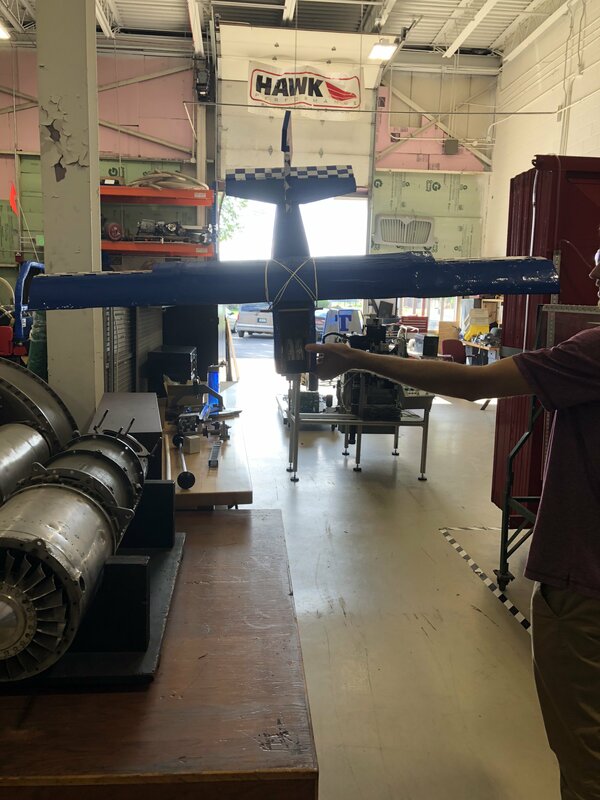 So we think we can get this done with a simple gear motor that pulls a string attached to each part of the wing that is folding. 7. Thank you very much for that offer! I will definitely be in contact with you if needed. 8. The rules say that we have to drive through the 2' x 3' box and from our nose to our rear landing gear can only be 2' so we are planning on sweeping both our wings backwards for the retracted position. The landing gear will be tricycle style, and we will have a pretty big NIMH battery upfront to prevent the plane from tipping backwards. 9. We thought of having a cf tube that acts as a spar that goes into the wing sections. I think we are going to try to go without it for our first iteration and see how bad it is. We also talked about running fishing line from the wingtip to fuselage to help prevent the wings from folding. That is a great idea to have the easy view safety system! One thing that our team is concerned about is trying to fly in Arizona. The air density in Arizona during the spring is about 25% thinner than here in Northeast Indiana. Does anyone have any suggestions for this? We have talked about having a higher voltage battery or higher KV motors. 1. Unfortunately NIMH is not my bag, so no, i really don't, sorry. 4.I'd say 500-750kv, depending on if you are running 6s or 8s equivalent (22.4 or 29.6). I'd almost say directly use the powerplants off of the anaconda or like ones. My point was more stay away from stuff you might see on a quad. Racing quad motors with tiny props and high kv are going to be inefficient, and i feel like the super low kv motors you might see on an endurance quad might be so low that you would be running additional throttle just for pitch speed. Do remember the formula for energy, 1/2 MV^2. Your prop is accelerating a certain mass of air at a certain velocity, this is thrust and pitch speed. You tend to lose energy a lot faster when you are increasing the pitch speed while maintaining thrust, as opposed to increasing the thrust and maintaining pitch speed. On the other side of that, though, using a large prop with almost no pitch means yes, takeoff is more efficient, but the motor and prop have to spin faster during flight to produce a usable pitch speed, which leads to friction losses. Having a larger, pitchy prop means that you will encounter losses and inefficiency during the shortest regime of flight, the takeoff, but as soon as you peel the throttle back, you are creating enough thrust for cruise flight at a reasonable pitch speed, and can basically sit up there for a while, since your aircraft does not have to land between laps. 5. That would work too. 8. Swing back wing is a good idea too, just keep it simple! 9. I'd stay away from draggy stuff like fishing line as much as you can, but it would probably work if you can get it to tension when the wings fold out without putting too much force on the motors for the wing sweep. And i wouldn't be super worried about air density. You will have some losses but it won't be 25%, as the lower resistance will cause the prop to spin faster. I'd just do your testing with a little less power, maybe cap at 80% throttle, and see how it acts on takeoff. It is good that you have a design in mind and by all means go with it as it is to be your design. If I was a member of the team though I would ask that the team consider the following. 1. make the plane layout a canard with large foreplane and a shorter than normal forward landing gear. ( a propeller driven version of the X29 though redesigned for slower flight with greater lift). The shorter front landing gear would calm down the landing as far as risk of the bounce. As the plane being a canard can be setup to land at stall and when the plane settles on its landing gear the foreplane and main wing automatically lose lift due to the negative incidence angle wrt to airflow because of its nose down stance. During a launch from the ramp the negative incidence stance wrt a positive ramp angle can give a positive angle of attack to the airflow especially with flaps and foreplane elevators. A canard does not require to rotate and apply additional negative pressure on its undercarriage to attain the increase in wing incidence and lift for lift off. The reason for the large foreplane is to give a greater tolerance of wide range CG changes and therefore the ordinance can be as widely spaced or separated as required in the supplied document without any serious balance issues. 2. The control surfaces used for said canard layout would be elevons outboard on each wing and flaperons on the canard foreplane and the inboard section of the main wing. Due to the 3 metre take off distance the provision of flaps for take off would allow for a far shorter ground run for take off and a slower stall speed. Whilst elevons are recommended it is quite possible that the craft could be setup without the elevon mix so that standard ailerons are used. This decision would need to be made after flight trials at max AUW. 3 The undercarriage would be fixed. 4.The drive through the box could be achieved with a single driven wheel, (or pair of wheels). on the undercarriage, (as in an automobile or car). This improves the efficiency of the ground handling and allows flight motors/propellers to be parked for safety and power usage efficiency. In addition it allows for the wings to be folded, rotated or otherwise stowed without a need to consider propeller arc of rotation and the damage it could do. Ideally the flight motors would be disabled by an interlock which is only enabled when the wing is in the flight position and locked. 5. The flight battery disconnect could easily be achieved by making the removable fuselage access or canopy as part of the flight motor power circuit. With the canopy removed or even in a not fully secured position the power to the flight motors is disconnected. Using a single brass strip on the canopy to make the circuit between to contacts makes the canopy a sort of blade switch as well as an access hatch. If the canopy is not properly secured the plane is disabled! 6. The wing form could be either folding up and forward, an excessive sweep forward, or a scissor wing arrangement. To suit stowage requirements. A keyed spar load sharing arrangement should be considered as preferable to any hard mating face load transfer design. Consideration could be given to the usage of a toothed belt operating mechanism as this can be built so that the wings are unable to sweep independently which would be disastrous. A keyed spar or dual spar design transfers the outer wing panel lift forces directly to the main spar or spars without any special wing joint reinforcement and hence weight. Locking can be easily achieved with a sliding collar spar locking mechanism. The collar can be defaulted to lock the spars. The list goes on and on! As the above is just a list of points to consider as if I was a team member AND I AM NOT! I leave you the shorter list to consider and to perhaps allow you to consider some of the design options which may not have been considered by your team. I look forward to your final design if you choose to post it for those interested. The air density in Arizona during the spring is about 25% thinner than here in Northeast Indiana. With thinner air, I'd be concerned about your wing loading. You may more wing area to carry 6-7 pounds. The air, most likely, will be a lot less humid.